After a long time, HUAWEI offered a new router again– the AF23, which can help a number of users to surf the Internet with Huawei 3G & 4G surf sticks via LAN or WLAN. Huawei AF23 has no built-in modem, so it must operate with a USB surf stick. We must pay attention to the highest possible speed of the HUAWEI AF23: the amazingly small router provides speeds of up to 300 Mbit/s over Wi-Fi and it’s also suitable for excellent Huawei E3276 LTE sticks. Included a USB cable and a power adaptor, Huawei AF23 is not expensive as a wireless router. 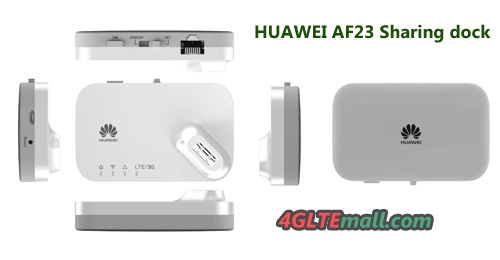 Huawei AF23 is not integrated with a battery which keeps the price low, but the HUAWEI AF23 can’t work as mobile 4G router like HUAWEI E5776. So it’s better to use the HUAWEI AF23 as a stationary router. The English Short Guide describes the basic features, no further information is provided. Normally, it’s easy to let HUAWEI AF23 working as 4G wireless router if you have a 4G Surfstick: simply plug a Huawei surf stick into the router, wait a few seconds and then you can connect via LAN or WLAN to the internet. The APN will be entered only in rare cases, most SIM card and network provider are detected automatically. If some adjustments are necessary, user can enter the web UI (192.168.8.1) in the browser and change the parameter accordingly. Like other routers, Huawei AF23 LTE Sharing dock also shows the important information such as the data consumption and reception strength about the mobile Internet. But the exact radio technology (only 2G, 3G or 4G) cannot be seen through this router. Nevertheless, the usual settings about the encryption can be made, and also an FTP server can be configured when using a memory card to the USB port instead of a surf stick. The speeds of Huawei AF23 are amazing and convincing in every respect. This is evident for connecting to the internet: after 20-25 seconds, the router is connected to the Internet. Wherever many networks are available, HUAWEI AF23 will always choose the fastest network. In the test with Huawei E3276, the Vodafone LTE network was connected in almost 20 seconds. At the same time, we test with the Huawei E3331, which takes only took a little longer to connect to the Telekom UMTS network. The integrated Wi-Fi module, unfortunately only works in the 2.4 GHz band and abandoned the use of the 5 GHz range. For the use of LTE Category 3, the almost perfect downlink speed could reach up to 90 Mbit/s in my test under Deutsche Telekom LTE network. But when working with AF23, the speed could up to 300Mbps via WiFi. The range of the wireless network from HUAWEI AF23 could cover around 50meters, which is suitable for a small house or a bigger apartment with thick walls. LEDs on the AF23 dock router indicate the current operating status, so users can have a quick glance whether the device is connected to the Internet and working normally. All in all, Huawei AF23 is a good WiFi router. The unit does exactly what it should do: to provide the Internet connection with a USB surfstick to support multiple devices quickly and easily surf. There are no compatibility issues there: all Huawei surf sticks manufactured since middle of 2009 are supported, future models can easily be added via firmware update.